New Delhi: Railways Saturday unveiled the new look of the Buddhist Circuit Tourist Train, a deluxe train with mini library, kitchen with state-of-the-art appliances and stylish bathrooms, a release from the ministry said. The train was flagged-off by Chairman Railway Board Ashwani Lohani. It will be travelling through sites associated with Buddhism -- Bodh Gaya, Rajgir (Nalanda), Varanasi (Sarnath), Lumbini, Kushinagar, Sravasti and ending with a tour of Taj Mahal, the release said. While the Buddhist train tour package operated by the Indian Railway Catering and Tourism Corporation has been running for the past 10 years with conventional Rajdhani coaches, railways felt the need to offer a new train with improved features, it said. Manufactured in Rail Coach Factory, Kapurthala, the new deluxe train comprises of 12 state-of-the-art LHB coaches with 4 first AC coaches, 2 second AC coaches, 1 kitchen car, 2 Dinning Cars, 1 staff car and 2 power cars. The first AC coaches, besides comfortable spacious cabins and coupes, have been fitted in-room amenities like individual lockers inside fixed ladders for tourists. The other coach amenities include bathrooms on either sides for showers with geysers, urinals in each lavatory, the release said. The second coaches have undergone a design change as the railways have done away with the side berths in these coaches which have been replaced with single-seater sofa for panoramic view during journey. A mini library and foot massager with sofa has also been provided. Besides passenger coaches, the new train boasts of a full-fledged LHB kitchen car for the first time on the Indian Railways equipped with latest kitchen equipments like hot plates, ice cube making machines, integrated exhaust system, chest freezer, deep freezer, refrigerator for the tourists, it said. There are two dining cars in the train, aesthetically designed with a seating capacity of 64 each. The two dinning cars of different colour themes have Venetian Blinds Windows for automatic opening and closing of windows blind. Equipments used in five star hotels like hot plate dispenser, microwave oven, coffee machine, bottle chiller, dish wash machine, among others, are provided, the statement said. The entire train is fitted with CCTV camera for better surveillance and Very Early Smoke Detection Alarm System for the first time for safety and security of the tourists. 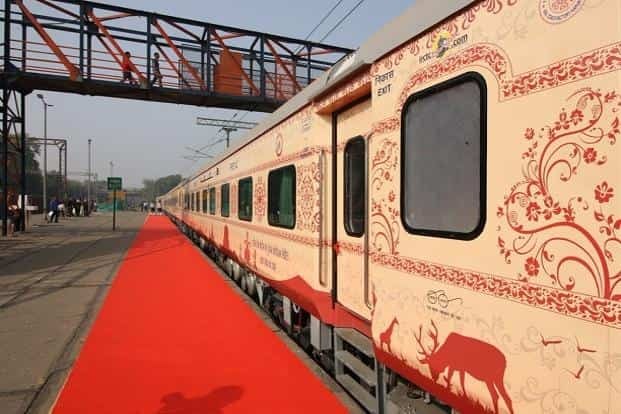 Overall, the train has unique vinyl wrap promoting Incredible India by depicting all the World Heritage Sites in India, other important sites, wildlife, Indian dance forms, yoga postures and Indian vegetation.